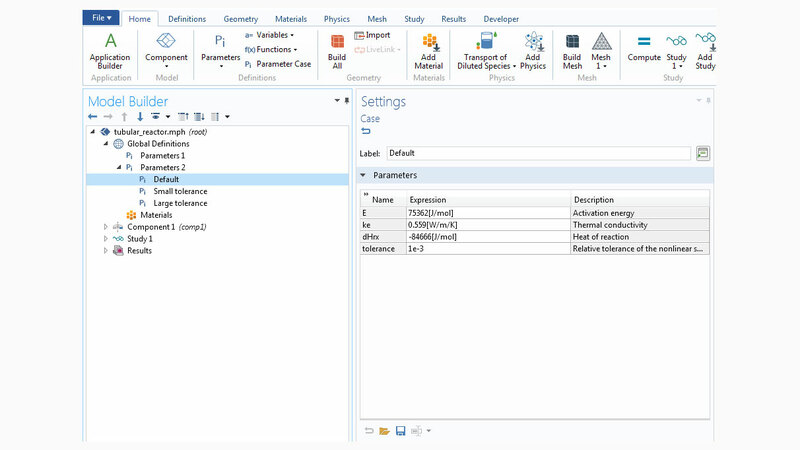 For all COMSOL Multiphysics® software users, version 5.4 brings selection colors, multiple parameter nodes, and the ability to compare different models and apps. 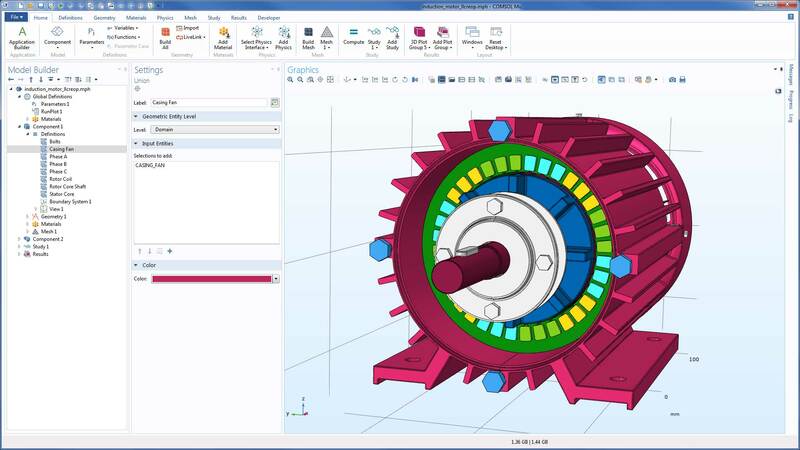 Learn more about these and other COMSOL Desktop® updates below. Assign colors to all types of selections, both under definitions and in the geometry sequence. This can be used to make it easier to navigate larger geometries in the graphics window by showing the structure of the geometry more clearly. The selections use color themes, another new addition. Color themes control the default colors available when coloring selection nodes in the Model Builder tree as well as the default color of the geometry and the selection highlight. Several color themes are included in the software: Basic, Dark, Light, RYB, COMSOL (shown in associated image), and Default. You can also create your own color themes for a custom look that fits your specific needs. Select the color theme in the Model Builder root node's Graphics section or by going to Preferences > Graphics and Plot Windows > Visualization > Color theme. Colors applied to the selections in an induction motor make it easier to navigate this large 3D model. 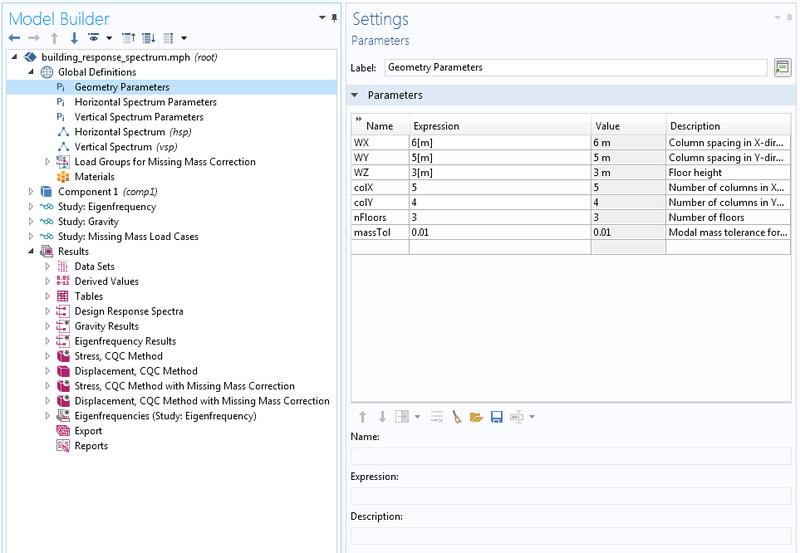 Do you have trouble keeping track of parameters in your model? Now you can structure them better by creating multiple Parameters nodes. In addition, Parameters nodes support cases, which let you switch between different sets of parameter values without importing and exporting them to file. You can also sweep over cases in the Parametric Sweep study step. 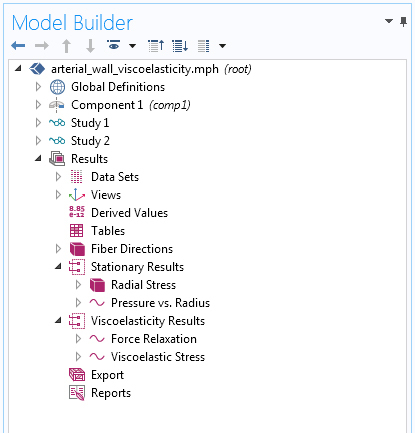 You can create custom node groups in the Model Builder and Application Builder trees. This lets you create a more structured model or app, and can make large trees with lots of nodes easier to navigate. Node groups are available for definitions, physics, results, forms, and methods, among others. 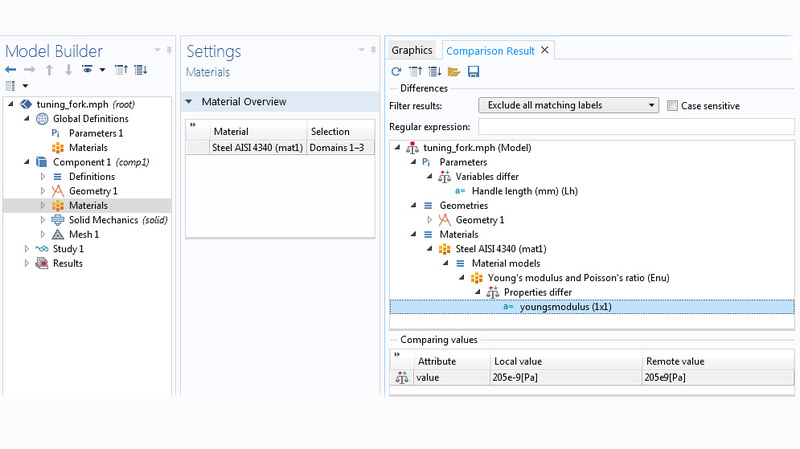 Comparing models allows for tracking differences in settings between a model open for editing and a model saved on disk. With the model comparison tool, it is easy to track changes that, for example, caused a solution to show a significantly different result. The same functionality is also available for apps. An example of comparing an edited model with the saved version that shows that the parameter "Handle length" and the material property "Young's modulus" have changed. The latter is responsible for an incorrect solution due to an erroneous minus sign. An example of comparing an edited model with the saved version that shows that the parameter "Handle length" and the material property "Young's modulus" have changed. The latter is responsible for an incorrect solution due to an erroneous minus sign.